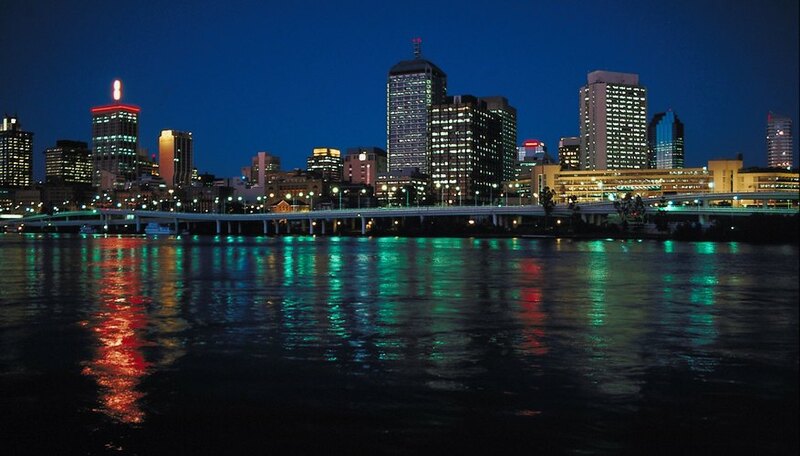 The Australian city of Brisbane lies on the Brisbane River, located in the northern tropical state of Queensland. This sun-drenched metropolis boasts a 128-acre botanic garden and is just a short drive from picturesque mountains and rain forests, making it an ideal destination in which to unwind and enjoy a romantic rendezvous. The city is home to a number of hotels that offer couples different packages and amenities for a romantic getaway. Enoy a romantic getaway at a Brisbane-area hotel. The Royal on the Park Hotel (royalonthepark.com.au) makes for an ideal romantic escape, as it's located right by the Botanic Gardens with views of the Brisbane River. This 153-room property features 24-hour room service, an outdoor pool and spa, and an on-site lounge bar. The "Just for Couples" deal includes overnight accommodation, chocolates and sparkling wine on arrival, as well as a buffet breakfast and a picnic hamper for a day in the Botanic Gardens. The Portal Hotel (portalhotel.com.au) provides boutique accommodations where guests are treated to complimentary toiletries, high-speed Internet access and in-room minibars. The "Romantic Getaway" package includes Prestige King room accommodations with romantic music playing on arrival, as well as rose petals and candles. Chocolates and wine are also provided, in addition to breakfast for two at the on-site O Bar. The Mantra Hotel (mantra.com.au) is located just steps from the South Bank Parkland and the Brisbane River, where couples can take romantic strolls. Spend a weekend here and request a suite with a private balcony. Stay inside and order room service -- which is available around the clock -- or relax together in the hotel's lap pool and spa. The Rydges Hotel (rydges.com) offers a couple of packages for a romantic getaway. Book the "City Lights" package and get picturesque views of the city and river from the hotel room, plus a full buffet breakfast, sparkling wine on arrival, overnight valet parking and a late checkout. Couples can spend time relaxing in the hotel's spa. Just across the river from downtown Brisbane on Kangaroo Point, the Il Mondo Boutique Hotel (ilmondo.com.au) provides a quiet and relaxing place for a romantic weekend. Rooms are modern and equipped with Wi-Fi service and Foxtel TV. Take a dip in the lap pool or go on a romantic bicycle ride with your partner around the island -- Il Mondo provides free rentals. Complimentary continental breakfasts are provided daily for guests. When it comes to dining, plan a romantic dinner at the on-site Italian restaurant. Enjoy views of Brisbane from nearby Hamilton at the Riverview Hotel (viewhotels.com.au). This elegant property features a resort-style swimming pool, sauna and spa, plus an in-house restaurant and two bars. Couples who book the River Spa package receive accommodation in a spa suite, breakfast for two, plus sparkling wine and strawberries on arrival. Guests are also treated to luxury toiletries and bathrobes, plus in-room minibars and a pillow menu for extra sleeping comfort. Oakley, Rachel. "Romantic Hotels Near Brisbane, Australia." Dating Tips - Match.com, https://datingtips.match.com/romantic-hotels-near-brisbane-australia-56156.html. 03 August 2016.